I am going to start by saying that I have a bias for the church. I have worked in full-time ministry in my church for the past 16 years, but more importantly, I believe that God has chosen to work through the church and, thus, the church should hold a prominent place in our lives. The church, as Paul describes it, is the body of Christ - the visible expression of who He is here on earth and of His glorious work. As Christ followers we continue Christ's work today through the church. At the same time, I also recognize that for some people, mentioning church brings with it pain and stress. While at the same time we recognize that the church is the body of Christ, the church is also made up of people. People who are fallen and by nature, sinners, who are all on a journey of redemption. It is an unfortunate fact that people hurt other people, unintentionally or intentionally. I, too, struggle with this at times. I have been hurt by people in the church. I, too, have I'm sure been on the side of hurting others in the church. But I also believe that God will heal and redeem the hurts that have taken place as a result of people in the church, through His chosen vessel, the church. So, today, wherever you may be on your own journey of redemption, let us simply take in Paul's words in Colossians as He lifts up and exalts Christ, the head of the church. The Greek word for church is "Ekklesia". It is taken from two words meaning "out of" and "called". In everyday Greek usage the word was used to describe any type of assembly, such as a town hall meeting. The early Christians chose to use this word to represent their local congregations because of it's use in the Septuagint (Greek translation of the Hebrew Old Testament) for 'the assembly of Israel'.They felt this word described the New Testament people of God and did not separate them from the people of Israel. In the New Testament the word is used both corporately and individually, meaning that corporately it describes all of God's people, and individually it describes a local congregation. Body, "soma" in Greek, is used two ways by Paul in this book. 1.) It is used to describe a physical body. 2.) It is used metaphorically to describe the people of God - the church - who make up the body of Christ here on earth. Today we will focus on its second meaning and touch on its first meaning when we look at other words in the challenge. "Now I rejoice in what I am suffering for you, and I fill up in my flesh what is still lacking in regard to Christ’s afflictions, for the sake of his body, which is the church. I have become its servant by the commission God gave me to present to you the word of God in its fullness—" 1:24-25. Paul saw his life as being an offering to God on behalf of the church. Thus, Paul's life role and focus was to care for and build up the body of Christ. "Do not let anyone who delights in false humility and the worship of angels disqualify you. Such a person also goes into great detail about what they have seen; they are puffed up with idle notions by their unspiritual mind. They have lost connection with the head, from whom the whole body, supported and held together by its ligaments and sinews, grows as God causes it to grow." 2:18-19. Here we see Paul make a direct reference to what one of the false teachers was teaching - false humility and the worship of angels - and Paul says of this teacher, that he has an unspiritual mind because he has lost his connection with the Head, Christ. As we saw in 1:17, and again here in 2:19, Christ holds everything together. He sustains us.. He is our all in all. The great wrong of the false teachers was in their defective view of who Christ is. 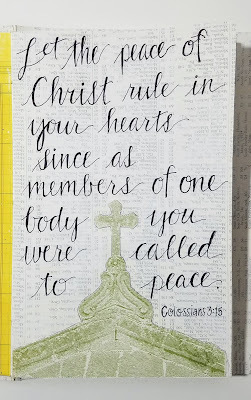 "Let the peace of Christ rule in your hearts, since as members of one body you were called to peace. And be thankful." 3:15. Part of our growth and maturity as Christ followers is to live our lives together in unity. We cannot individually be the body of Christ. A body must have different members and body parts in order to be whole, in order to fully express and display Christ. The peace of Christ is what holds us together. 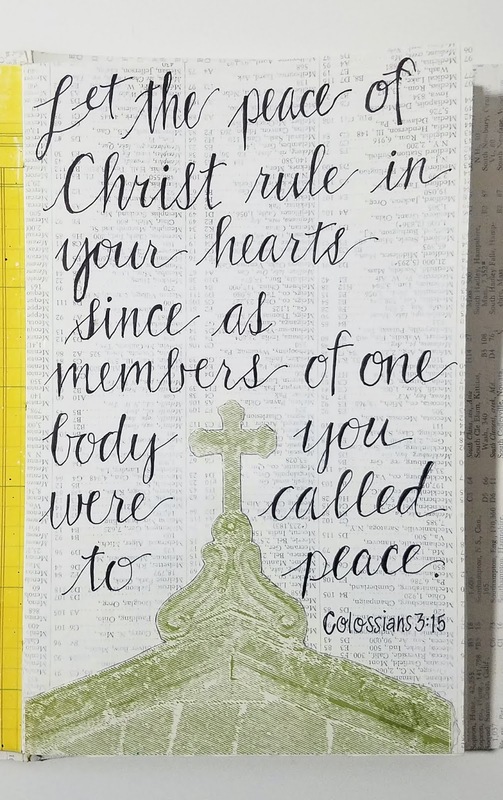 Peace brings with it both the reminder of the shalom peace of the Old Testament and the peace of reconciliation with God as described in Colossians 1:20. The church is to be an expression of the reconciliation we have with God through Christ.